I’ve decided to get a little wild for today’s blog post! See what I mean? The photo of me at the pet store wearing that lion mane was such a big hit, that my human decided to find one for me that fit better. So she looked around on Amazon, and found one that got lots of complaints for being too small. She knew that was the one for me and she ordered it. She was right — it fits perfectly! 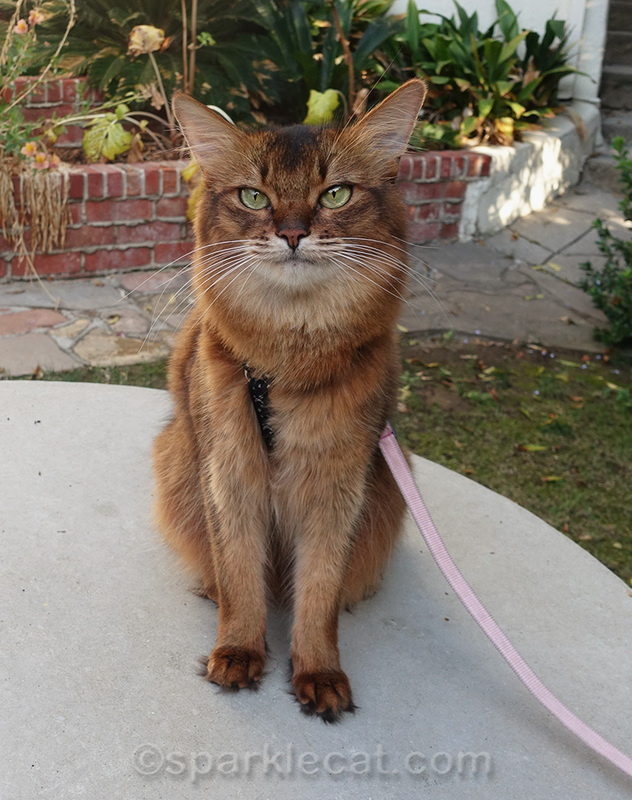 Of course I can’t just sit around on a table and be a real lion — I have to go on the prowl! Hm. Something tells me I’m not as intimidating as I want to be. Maybe I will look more feral in a closeup. Or maybe not. Okay, I’m done being a lion. I want to go back to being a kitty. Can I have a treat now? The last pic looks like something you’ve killed and hunted and now you are displaying it to your mom. I can’t believe how that mane really blends with your fur. Your mom did a great job picking it out. Summer being wild for a little while is good for you. you don’t look really intimidating, Summer. Perhaps that is a good thing, as you don’t want to frighten your cat therapy patients! That is too cute! 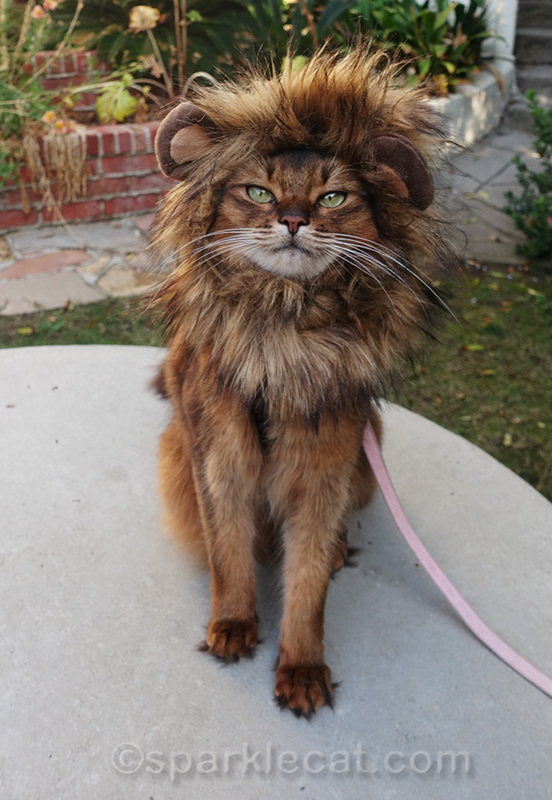 Piper doesnâ€™t tolerate costumes AT ALL so once I photoshopped a lionâ€™s mane on him. I think he thinks heâ€™s a real lion! You should be on Broadway as the “real” star of the ‘Cats’ Musical! Maybe you could be the director of costumes, too! Wow! Your lion mane looks amazing. 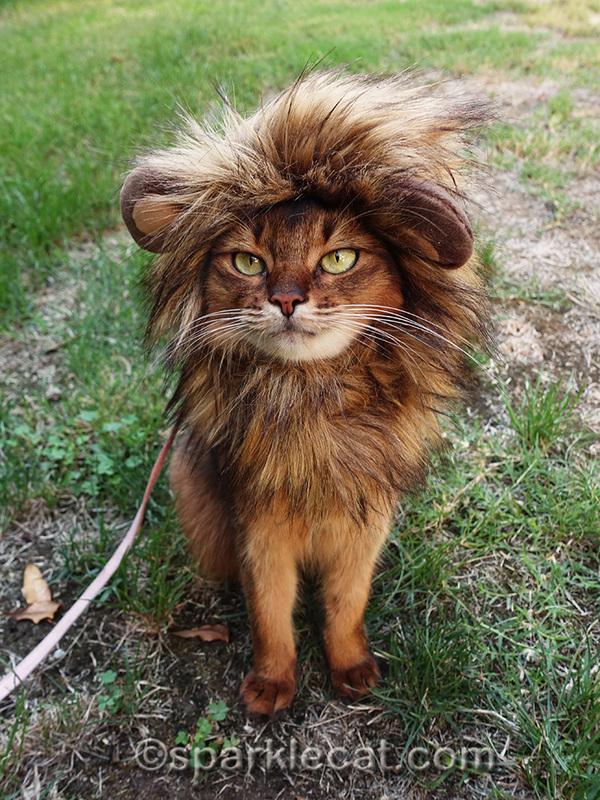 We really thought you were a lion for a minute…MOL! 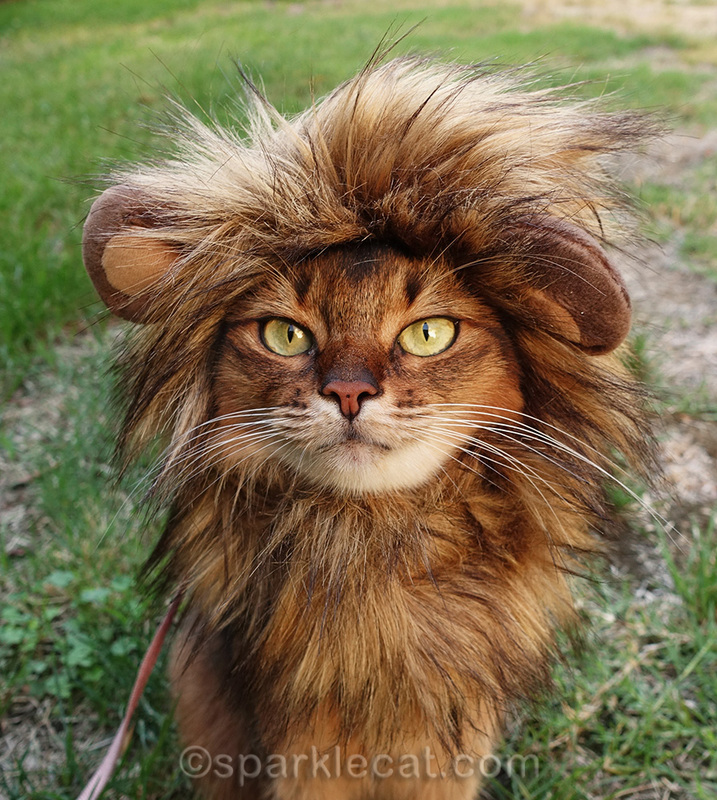 That lion’s mane matches your fur perfectly! We love you as a little lion too! WOW! When when we saw the first picture of you in the lion outfit, we were so surprised we JUMPED! I love it! You look like a real lion. Roar! What a great Halloween costume? 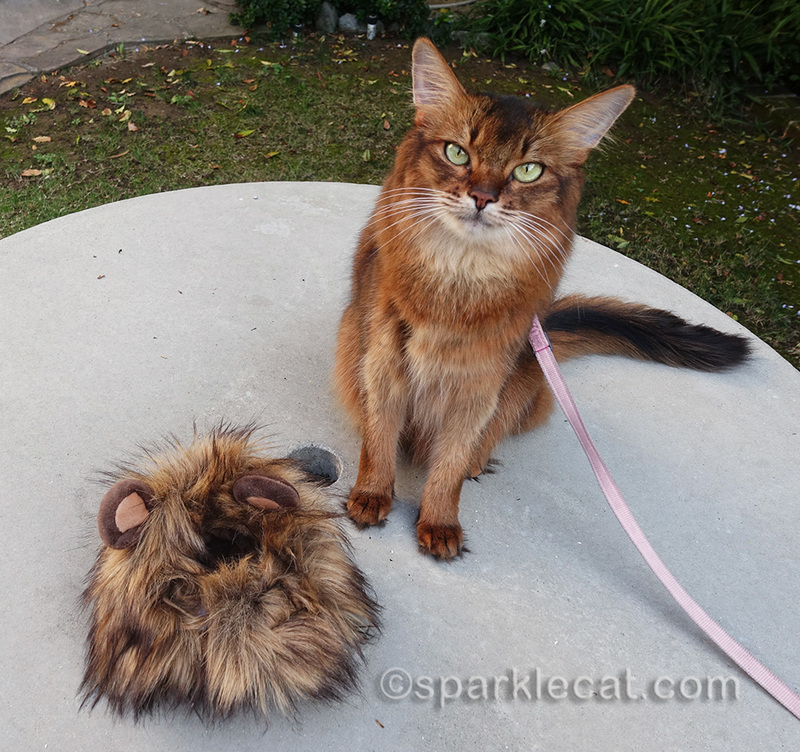 What will Binga and Boodie be for Halloween? Oh my gosh. This is the cutest thing ever. The lion mane matches your fur color purrfectly, Summer! How about the lion’s mane AND a sundress? I am trying very hard to be scared if your feral look. You make a ferociously cute lion, Summer! OH. MY. GOSH!!! Cutest picture we have EVER seen of you!!! Summer, your human should have cloned out the leash. You look like a real lion although a tame one. You needed to ROAR in one of the pics. You look pawsome there Summer. You look good Summer as a lion. Your lion mane matches your fur colors perfectly. We really like those pictures. Oh, my stars! Could you be any cuter?? It matches your fur purrfectly. You are the cutest lion! the mane suits your colour so well. That mane looks perfect with your fur! I am Summer, hear me roar! You look mean and magnificent in all your leonine glory. You are a sweet lion, Summer! I didn’t think you could get any cuter, but that lion hat…wowie wow wow! THAT was fabulous! We were quaking in our toe hawks . . . almost. MOL! You look wonderful and ferocious! A beautiful wild lioness, who protects her Pride! You look very wild. Have you tried scaring Binga with it? Fabulous fotos and that is the BEST accessory your human has ever gotten you – the best! i bought one of those for the boyz. it had a paralyzing affect on all three. when I tried to put it on it was like there legs stopped working. You are too adorable in that mane!! Everyone needs a walk on the wild side occasionally. Summer, all you need to do now is roar! We think you wore that mane like a BOSS, Summer! And yes, make sure you get some treats for doing such an awesome job modeling. 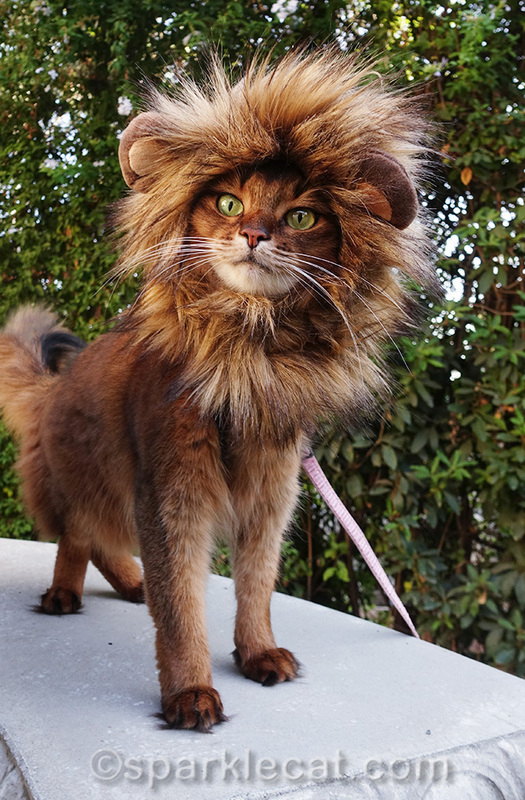 You make da cutest lion! That lion hat really makes you look like a lion! You look intimidating to us! Cool pics.